Auction house Vermot de Pas has cancelled the appearance of Nazi items in an April 26 auction after multiple groups objected. Critics called the sale obscene and insisted the sale would give the items “unhealthy symbolic value that resembles cynicism and a form of moral indecency”. The Nazis and the Holocaust are difficult topics to deal with. Today, survivors still live, but even after the last of them pass, the topic will not easily fade from the public mind. But I don’t think this is the answer. If all you know of the Holocaust is that it killed 10 million people, including 6 million Jews, you’ve received the happy, sparkly version. The numbers are the least horrifying aspect, in my opinion. What gets me is the stupefying amount of detail put into the process. These people were not simply discarded as racial trash. They were meticulously murdered, with every step of misery planned to the last detail. Why not just shoot them all? Too inefficient for the desired scale and a waste of too many bullets. One survivor reported how a relative was shot once and left to die because the relative wasn’t worth a second bullet. Babies were sometimes thrown alive into graves. At war’s end, some prisoners survived because their guards decided they weren’t worth the ammunition. They recycled the dead, removing gold teeth fillings, scattering crematory ash as fertilizer, and weaving hair into blankets and socks for the military. Soldiers were wearing socks made of dead people. How do you keep the inmates from panicking? You don’t just tell them the gas chambers are showers. You tell shivering and starving people there’s hot coffee waiting for them. The camps were not merely places of slave labor and execution. They were places of torture, terror and humiliation. Prisoners disciplined other prisoners. Human waste overflowed toilet facilities, forcing prisoners to walk through it. The people Nazis saw as animals to meant to feel like animals. Glorifying these crimes is beyond heinous. However, that is not the motivation of many people seeking Nazi antiques. History-keeping is evidence-keeping. It’s not just paperwork and testimonials. It’s not just numbers. I visited the Holocaust museum in Washington DC a few years ago. It’s a tough thing to experience. But you know what sucked the breath from my lungs? A room full of shoes. 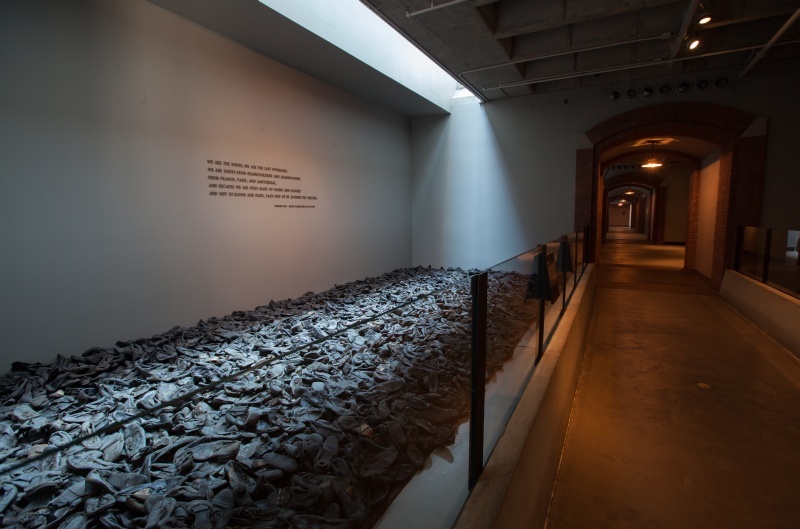 4000 shoes, each belonging to a prisoner never able to reclaim them. They didn’t belong to numbers. They belonged to people. I can tell you 10 million people died in the camp. Or I can show you a room full of shoes. I have seen Nazi items in antique stores before, specifically a Nazi armband and a yellow star which Jews were required to wear. I had no interest in purchasing them, but I recognize others do and for reasons that have nothing to do with pro-Naziism. These are reminders of history. To me, squirreling these items away is much more of a disservice than displaying them. People need to remember, and the topic should not be shied away from because it happens to be unpleasant. Quite the opposite, some of the worst events are the ones we should know the most about. I’m confident the auction house has sold other items formerly owned by infamous people. So if we make policies specific to possessions of high level Nazis, isn’t that giving them an unhealthy symbolic value?